A central research topic at IKV is that of continuous vulcanisation in the production of rubber profiles such as hose and seals. Together with industry partner Gerlach Maschinenbau GmbH from Nettetal, the research team has succeeded for the first time in obtaining extensive process know-how on different heating strategies and forms of energy during vulcanisation. The obtained data serve not only to optimise the process but now also to develop process models. Before now, continuous vulcanisation in the production of continuous rubber profiles was a process that could be neither monitored nor regulated – so to speak a black box process. Whereas a comprehensive sensor system in the mixing and extrusion process provides thorough process information and, for most sub-processes, various tested models exist, the vulcanisation process had to be adjusted entirely by empirical means. Until now, mechanical properties have been used as the main criteria for the quality approval of the produced rubber profiles. One important characteristic is, for example, the compression set, which is an acceptance criterion for many OEMs. Various standards stipulate a measuring time of at least 24 h and frequently up to 72 h for measuring the compression set. During the measurement, production must be continued despite the uncertainties. Even a qualification of the process is not possible without plant and product-related measuring data. For these reasons, a working group at IKV is looking intensively at the continuous vulcanisation of rubber profiles. 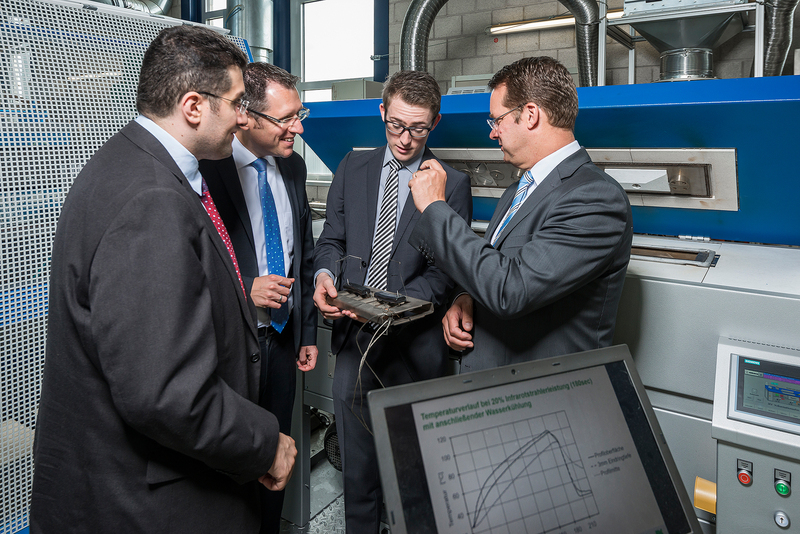 Using the newly developed measuring system (HeatStraD – Heating Strategy Developer, photo), the research team is working together with the industry partner to draw up comprehensive process know-how. This data serve as the preliminary stage for the development of process models and are also used to identify robust process points for continuous vulcanisation. The aim of the next step is to use new models and findings based on the process and database in order to specifically set and ensure the quality of vulcanised rubber profiles. A holistic digitisation of the process chain is thus made possible. Apart from that, a new technology, for which IKV has applied for a patent, is currently being developed and tested. It will enable IKV for the first time to measure the state of cure of vulcanised profiles immediately after leaving the machine or at the end of a production line. In this process, an analysis of the resonance frequency of the vulcanised profile is used, which, under isothermal conditions, correlates very well with the degree of cure or crosslinking. In order to be able to use the measurements not only for quality monitoring but also for the holistic digitisation of the process chain within the meaning of Plastics Industry 4.0, it is intended to set up a research project (an application for funding has been submitted) to further develop and implement the vulcanisation measuring technique for continuous processes, and also to develop a temperature measuring technology and process-integrated temperature modelling for correcting the crosslinking measurements. Together with Gerlach Maschinenbau and CT Datentechnik, this will be substantiated with process examples and a proposal system for process point optimisation. The data will then, with the help of an innovative man-machine interface, be made available to the machine operator.